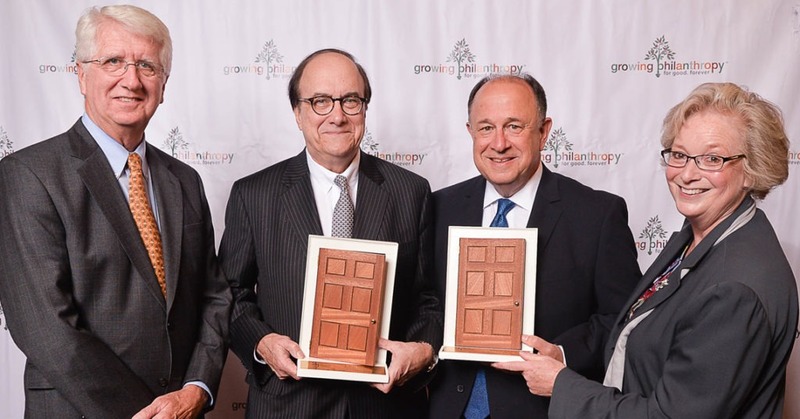 October 2018 – The Chester County Community Foundation marked its 25th Anniversary and Annual Meeting on Monday, October 22, by honoring two outstanding individuals with the Super Door Opener Award. Louis N. Teti, Esq. of West Chester and L. Peter Temple, Esq. of Kennett Square were recognized for their ongoing efforts in opening doors to legacy philanthropy. A partner at MacElree Harvey in West Chester, Teti represents individuals and businesses in a wide range of estate, business succession, and tax planning matters. He speaks frequently on estate planning, tax planning, estate administration, and philanthropic planning. 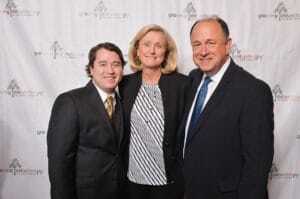 Lou Teti pictured with his wife Joann and son Jeff at the Chester County Community Foundation’s Annual Meeting. Teti has served as President of the Pennsylvania Bar Association and the Chester County Bar Association, and he is a past Chair of the Disciplinary Board of the Supreme Court of Pennsylvania. He has also served as Chairman of the Pennsylvania Bar Foundation and the Chester County Bar Foundation. In other volunteer leadership capacities, Teti has served as Chair of the Board of the Chester County Community Foundation, as well as Chair of the Board of the Paoli Hospital Foundation, where he continues to serve on the Board. He also served on the Board of Trustees of Malvern Preparatory School for nine years. Founded in 1880, MacElree Harvey is a full-service law firm serving Pennsylvania and Delaware. In addition to its broad-based litigation practices, the firm represents clients in corporate law, mergers & acquisitions, labor and employment, real estate, banking & finance, bankruptcy, family law, estate planning, tax law, personal injury, and criminal defense.